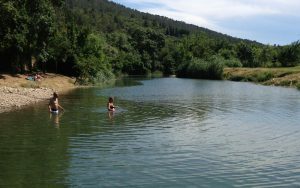 Situated in the wild and beautiful Corbières Hills on the banks of the river Orbieu and known as ‘one of the most beautiful villages in France’. Lagrasse is both an inspiring and relaxing place to visit. Famous for its Benedictine Abbey, founded in 799 by Charlemagne, its picturesque covered market, the 12th century hump back stone bridge, and its labyrinth of medieval streets. 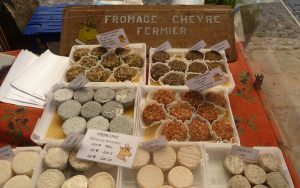 Throughout the year Lagrasse village and surrounding areas offer a variety of places to explore and many things to do. Lagrasse is ideally situated to experience local culture, sample the cuisine and the abundant wines of the area. Once the home of the Cathars the region is steeped in rich and mysterious history. Only a short distance away is the wonderful medieval cité of Carcassonne, the Cathar castles of Queribus and Peyrepertruse and the Abbey Fontfroid with its beautiful gardens. The vibrant cities of Montpellier and Toulouse are also within easy reach. Only 40 minutes from the Mediterranean beaches you could spend the day windsurfing, sailing or sampling fresh oysters and sparkling wine from Limoux (the original French bubbly!). Those with an appreciation for nature and art may wish to explore the Sculpture Trail, a wonderful walk through the hills amongst a diverse and eccentric collection of sculptures made of many differing mediums. Collioure the famous Fauvist centre or the Museum of Modern Art in Ceret is only about 90 minutes drive away. The beautiful Medieval villages of the Costa Brava in Spain, old Girona and even Barcelona are further exciting places to explore and also easily accessible. 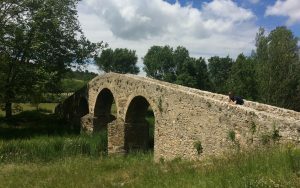 Alternatively, take a trip into the dramatic scenery of the Pyrenees or cruise the Canal du Midi, go cycling (there are bikes on site which may be available for you to borrow and there is a very convenient bike hire right next door), walking, horse riding or, simply relax on the beautiful river terrace.